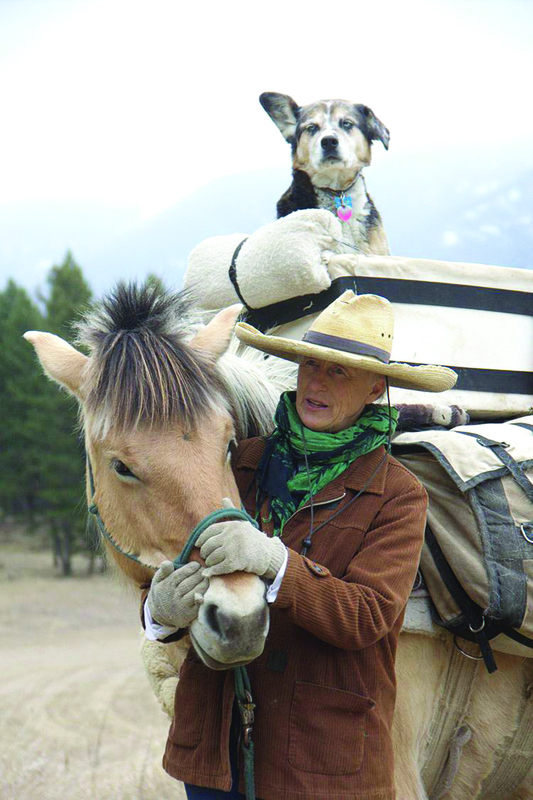 Home, for Bernice Ende, is on a horse. She has ridden 30,000 miles over 14 years across the Great Republic and beyond on the back of a horse. From her perch 12 feet high, with panoramic views, she has seen the world from a different perspective than almost anyone alive, and now she has written about it. Ende came to the Mammoth Lakes Public Library on Wednesday to give a presentation on her first book, Lady Long Rider: Alone Across America On Horseback, which came out in June. Mammoth is just one stop along her 8 month, 60 stop tour starting in Montana and ending with a talk at Harvard University, “If I make it,” she said. Bernice sleeps in an alcove in her horse trailer while touring. She has insulated, carpeted, wallpapered, and lit her little alcove. Now it is her home. No one will make you question the notion of ‘home’ more than Bernice Ende. During a reading from her book she told of a ride through a blizzard along one of the interstates that bisect this country. She read that she must have looked homeless to the warm drivers passing by, and she felt sorry for herself. “Looked homeless,” that’s what she said. Here is a woman who sleeps on the ground every night. Who has no money. Who must forage for nettles, wild asparagus, rose hips, and huckleberries, sometimes steal, just to survive. She has relied on the kindness of others for food, water, and shelter from the storm for 14 years. “Looked homeless?” It seems clear as day that she is homeless, but she doesn’t see it that way. She owns a cabin in northwest Montana, but, “that is not my home,” she said. Early on in her long riding career, (A long ride is any ride on horse back over 1,000 miles, as defined by the Long Riders Guild), when she would sleep outside without a tent, she craved the warm confines of an inviting stranger’s home, but, “that is not my home,” she said. Home, for Bernice Ende, is on the heightened plane of awareness of life offered by the imminence of death, which long riding provides. It is not geographically confined. She finds home on the Mexican border, in the caves of Perch Merle, where French neanderthals painted the ancestors of Ende’s own mounts, and in abandoned barns across America. With her gun at her side, she finds home where the flick of a horse’s ear spells rattlesnakes and bears and moose that hiss and growl warnings of approaching death. Her home is uncertainty. Ende has the energy of a cricket. She is frenetic, restless, electric, and warm. Like a cricket, her life is lived through a series of sublime, weightless leaps. The cricket jumps, and having jumped, loses all certainty. It tethers itself to the hope that at the end of this flight there will be a place to land. In this heavenly moment Ende finds her home. To her, walls are silly things. Within moments of entering the library she began rummaging through the employee pantry in the back of the building, searching for tea or cookies or anything worth having; She treats strangers the same way she treats pantries. The whole world seems to her wrapped up, waiting to have its swathings torn off to reveal the colors inside. In there, too, she finds her home. “Food and shelter have been extended to me by people I don’t agree with philosophically,” She said.